So here we are back with another Quick Draw session, Episode 3 to be exact! On the chopping block today is the Quesada Oktoberfest Bavaria and the Cohiba Maduro 5 Secretos. I’m flying solo on today’s Quick Draw and bringing you both of the writes ups below. I came down with a nasty cold (again…) so I haven’t been up to a full review. So I dug into my notes and pics to bring you these two write-ups instead. If you haven’t read one of our Quick Draws before, it’s basically a quick review of a cigar we’ve recently had. Perhaps revisiting an old one, trying a new one, something we didn’t intend to review but surprised us, or whatever other reason we can think of. Without any more blabbering, let’s just jump right in! So Quesada seems to have had a pretty stellar year in 2011. Problem for me is that their sticks are super hard to find up here in Canada. There are only a select few retailers willing to ship to me and they obviously don’t get every possible cigar in. Every once in awhile when I vacation in Florida I pick some up or some people south of the border are kind enough to trade with me. This Quesada Oktoberfest came my way by non other than our very own Tony Casas. Now Tony reviewed this cigar while back in October, see his review of the Quesada Oktoberfest. As you might be able to tell, he thoroughly enjoyed it so I had high expectations going in. Now I gotta say that this is one incredibly oily and super toothy cigar. It definitely has an appeal to it and has some heft to go along with it. No doubt this cigar looks delicious just with your eyes so I was excited to light it up. After lighting it up I was immediately met with a blast of flavors including spice, cedar and a touch of sweetness. A well balanced and tasty start. As the cigar progressed I was met with all kinds of other interesting flavors including cocoa, coffee, nuts and a sort of butter cookie sweetness all wrapped up in a smooth creamy finish. Not to mentioned this thing burned like a champ without the need for any babysitting at all. 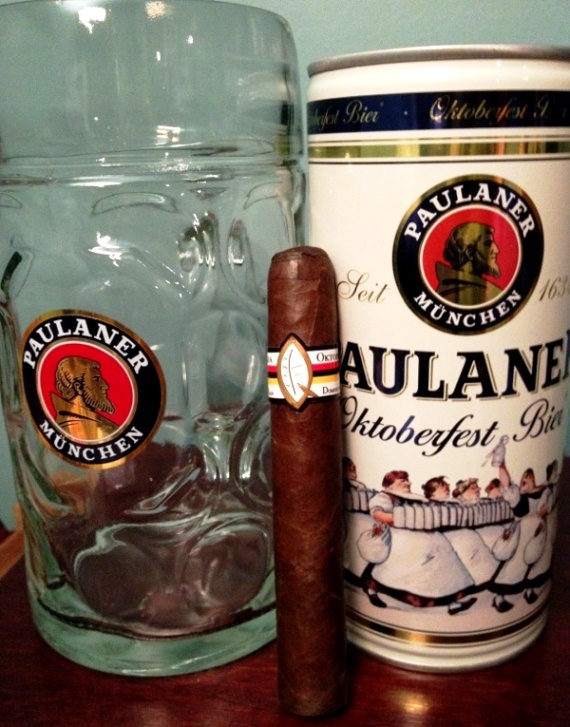 Not only did I get the Quesada Oktoberfest cigar, I was also able to track down some Paulaner Oktoberfest beer locally. And the huge beer mug is an awesome conversation piece too! That can you see there filled it up exactly to the brim and I drank every last drop, such a great pairing. So did I like it? Hell yeah! Who wouldn’t like an awesome array of flavors like that! The beer just made everything balance even more bringing in some more interesting flavors to the party. Really glad I managed to put this pairing together, it did not disappoint! A while ago I sprung for a half-box of Cohiba Maduro 5 in the Magicos vitola(Robusto) and even posted a review of it here. As you can tell from that review, I really enjoyed that cigar. Problem is, they are a pretty expensive stick to get a hold of, even straight from Cuba. So when I was placing my latest order of Cubans I decided to give the smaller “Secretos” vitola a try, which is a small corona type of size. I lit up this cigar hoping for more of the smooth creamy chocolate and espresso notes I enjoyed on the Magicos. Unfortunately, the Cohiba Maduro 5 Magicos did not live up to my expectations. It started off with a fairly bland tobacco flavors and went downhill from there. I mostly got charred and harsh flavors through the whole experience and it burned really hot. This was a big disappointment, especially at about $7.00 a piece from the cheapest source I could find. $7 for a tiny little short corona is definitely pricey and I would expect a top quality smoke for that kind of pricing. So does that mean it’s completely written off? Not sure yet. The only saving grace these might have is if they need some age. I think the box date was early 2011, so not even a year old yet. But I’m hesitant to think it can improve that much with some time… but I’ll hold on to them and see what happens in another year or so. If you seeking to buy some of the Cohiba Maduro 5’s though, I would seriously suggest just forking out the little bit extra and getting one of the larger vitolas. I can’t stress how much I REALLY enjoyed the Magicos vitola, so don’t write off the entire line! The Oktoberfest was probably my favourite cigar from last year. Where did you get the beer and glass? Sorry to hear about the Cohiba’s…disappointing indeed. Seems the Oktoberfest got a ton of good press, lots of people liked it. The beer and glass I found at the LCBO, came in a package. I’m using the glass to store cigar bands now, looks pretty cool! haha. It was only around for a limited time around October, maybe they’ll have it again next year? I need to spend more time at the LCBO! 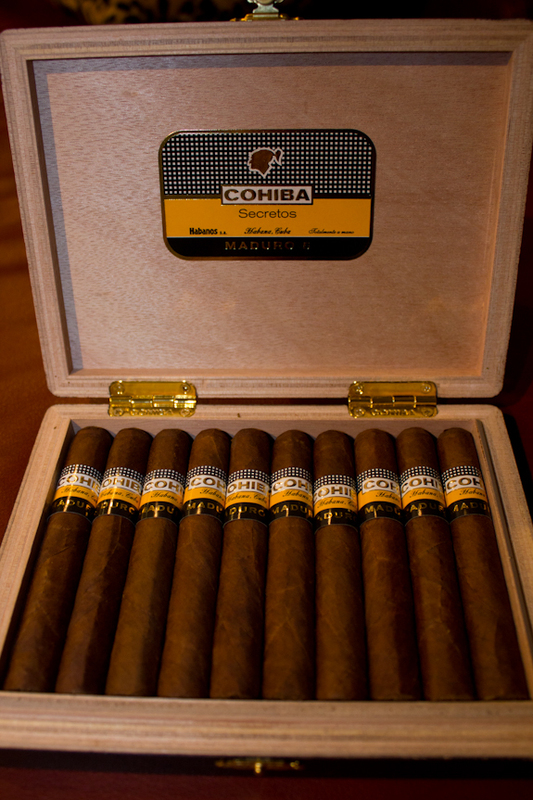 The Cohiba Siglo IV used to be my go to smoke…a five pack would always accompany me home from a vacation in Cuba…I have always had good experiences with Cohibas…fingers crossed for you that those improve greatly with age.